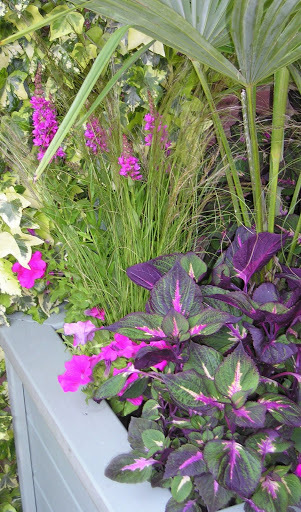 This entry was posted in box, gardening, herbs, raised beds, salad and tagged bay, box, coleus, harvest, Lythrum, onions, palm, raised beds, salad, scallions, watercress by johnshortlandwriter. Bookmark the permalink. Johnson, what a great idea. I haven't seen greens sold like that with their plugs over here yet (except full grown lettuce) but what a bonus if they did.The design for your raised beds was just beautiful, and if we built another one, I would copy it…yes I would)))) ..if you don't mind. I love the angles and the one installed by the brick wall, it is perfectly sited. I love the stain color and the plantings. Really really lovely. Haven't watched ADT yet but will soon.Nice plating by the way)). Sorry to post again..but wanted to comment on the problem we have had with our raised beds lined with plastic..although I can't see a way around doing it otherwise…but the earwigs have been horrible..living and breeding between the wood and the plastic (coming out at night to feast on the plants). Would be pleased to know if you were troubled by insects in your raised beds as above. Perhaps you don't have earwigs in England. What a good idea, I've seen more ready grown veg plants in the garden centres this year than I can ever remember, but the cost is prohibitive, £2.50 for half a dozen salad plants, this sounds like a much better bet. Kathy – it's encouraging that garden centres are selling veg now but, I agree, an expensive way of doing things.My salad seedlings came from our local supermarket and cost only £1. I've also bought some past 'sell by' date (so a bit shabby looking) reduced to 50p but they were fine for growing on.